Here is a view from the river of the Teneriffe Wharves area taken in 1991. In the left background is the Elder Smith Wool Store. Brisbane's urban renewal is about to commence - the wharves will be demolished and the warehouses converted to other use. And now a picture from 1997 showing the wool store in its then life as a large furniture complex. 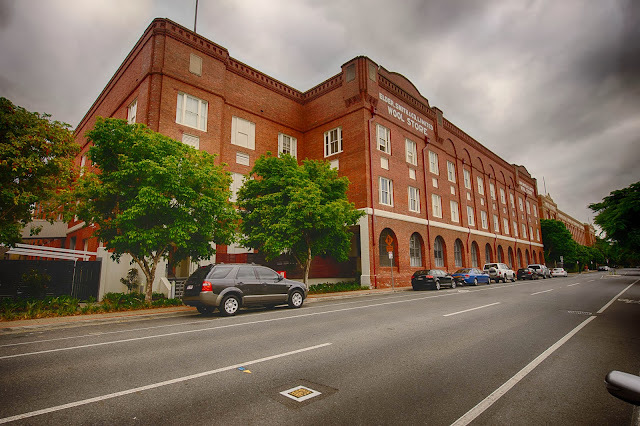 The three floors of the former wool store have been converted to retail space, and if that is not sufficient for shoppers, the next wool store down is also a furniture retail outlet. Further down the street the Mactaggarts Wool Store has already been converted to residential space, and the buildings in this photograph are about to follow suit. And here is a more recent image. The Elders building has been converted into an apartment building known as Ansonia. In twenty-five years this once industrial area has been transformed into a medium density residential area, as well as commercial space featuring restaurants and cafes. No-one opposes Brisbane's urban renewal but at what expense? At least the wool warehouses were preserved and converted to other uses. Couldn't the wharves have been regenerated instead of demolished? I have been to a few weddings in Melbourne's old port area - the wharf sheds looked super. I agree that the Melbourne port area looks great. The makeover in Brisbane limited the height of new buildings on the site of the old wharves to three storeys - the same height as the wool stores.